BANGI, 28 Feb 20 2014 – A massive effort by the relevant governments is needed to restore and renovate heritage buildings of the Cham minority people in Cambodia, Laos and Vietnam. Assoc Prof Dr Mohamad Zain Musa from UKM’s Institute of the Malay World and Civilisation (ATMA) said countries in the region can share their expertise and funds to save the antique structures built by the Cham ethnic group. Dr Mohamad Zain – a Senior Research Fellow at ATMA who studies Muslim communities of Indo-China – feared that the design excellence of the Cham community will simply disappear if a rescue effort is not mounted. He was speaking at the seminar in appreciation of Prof Emeritus Dato’ Dr Nik Hassan Shuhami Nik Abdul Rahman’s 50 years of contribution to archaeology, here recently. He had been touring around Cambodia, his home country, to observe some of the old buildings in the villages of the Chams. The oldest Malay Muslim kingdom was founded by the Chams in Cambodia. The Chams are remnants of the Kingdom of Champa which thrived between the seventh to 18th centuries. They are closely related to other Austronesian peoples and speak Cham, a Malayo-Polynesian language of the Austronesian language family (Acheh–Chamic subgroup). This contrasts with the majority of Cambodians, Thais and Vietnamese who speak languages ​​belonging to the Austroasiatic group. Dr Mohamad Zain, of Cham descent, mentioned several buildings, homes and monuments carved with flowers and Quranic verses that describe various stories about the environment and socio-cultural aspects of the ancient kingdom of Champa. Some of the monuments are still standing on level ground, in the hills and around the fields and scenic rivers. However, the buildings are over 150 years old and rather dilapidated due to neglect stemming from political unrest and wars during the 1970s in Vietnam and Cambodia . Dr Mohamad Zain, together with his research partners have made significant contributions to the development of research on Campa and Muslim communities in Indochina. He lamented, however, that the kingdom of Champa, the world’s oldest Malay kingdom in history, had disappeared long ago. 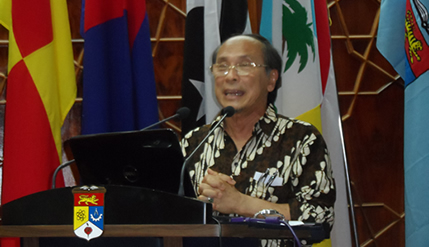 Dr Mohamad Zain has a bachelors degree in Science (Physics) from the University of Phnom Penh in 1974, and did his masters at the University of Sorbonne in Paris in 1990. He received his doctorate in philosophy in Malay civilization at UKM in 2009.